NOTD - Orange County Nails - Be Glossy In and Out! Today I felt the need for orange, one of the summer`s color. I wore it with my clothes and accessories. 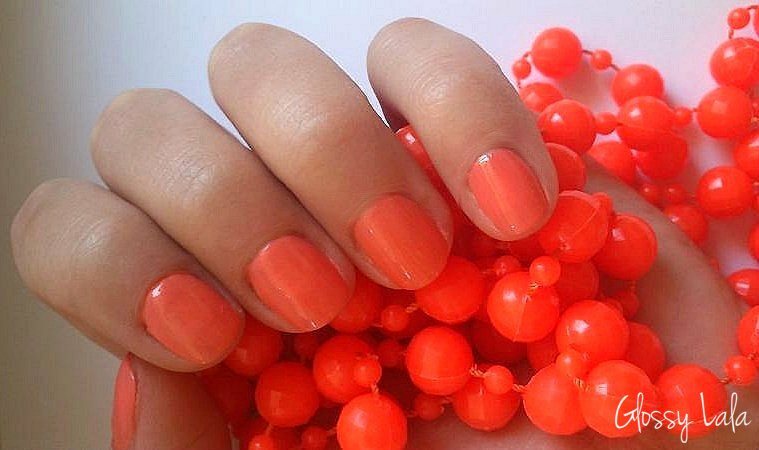 That`s why I show you my orange nails:) They are simple and represent my interior mood.The nail polish is from Tommy G.
Beautiful orange love the beads! I just loved your nailpolish. Also loved your blog. I'm following you now. I love oranges and coral tones for summer - lovely! Yes dear , we can follow each other ! I started ! beatiful!!! i'm following your blog!!!!! Join my Jewelry Give away at my blog! Hi Lala, thank you for visiting my blog and for the sweet comment. Orange is one of my favourite colours this summer, so vibrant and beautiful! Essie's "meet me at sunset" has been my go-to nail polish since the beginning of spring! That color is amazing!! Love!! Dear Lala , thank you so much for visiting my blog . I am already following you ! Would love to see you follow back ! Thank you fo visiting my blog, I followed. You have nice blog. Hi dear :) I love the color! Thanks for visit! Now I follow you, if you want follow me back. cea mai vesela culoare ! Thank you for following a while ago! I follow you back on gfc now! Waiting for your follow on bloglovin! Let me know when you do so I can follow back! I like colors nail polish!! Thanks for stopping by on my blog, and of course we can follow each other. I'm following yours now, it would be great if you'd follow mine to. hey sweety, thanks for visit my blog, about the follow of course we can follow each other... I´ll start follow each other on GFC and bloglovin so I hope you can do the same for me ok! Love the orange! Thanks for the nice comments on my blog! I'm now following you! Follow back? nyway, just followed u thru GFC, maybe u want to chek out mine too? this color is soo cutee :) i love the photos you took, and this is perfect for summer! Thanks to visiting my blog. Nice post! Thanks a lot for Yore words! Yes i like to follow each other, your blog is fun! I startend following you bij gfc and bloglovin. I love your nails!! I'm following!!! Can you follow me please? thank you :) http://www.fashionstyle--blog.blogspot.com.es Your blog is fantastic! Ok, I followed you back!!! Thanks hun!!! I followed back!! Thanks Dina!!! I followed back!!!! hey woow this nails look amazing , i really like !! Maybe you are interested in follow each other ?! Thanks, great blog!!!!! I followed you, hope you do the same! Thanks Patricia, yours is great also!! I followed you!! Thanks Marie, I followed you back!! Thanks, I followed you back!!!! Thanks Brittany!1! Followed you back!! Thanks, I followed you back on GFC and Bloglovin.. Thanks, great blog you have!!! Sure I followed you on GFC, FB and Twitter!!! I don´t know why... I was following you yesterday, and now I´m trying to follow but your blog doesn´t allow me =( I´ll keep trying in a few hours ok! im def obsessed with this color! especially on nails! super super cute! Love that nailpolish, sucha lovely and fresh colour! Love that nailpolish, such a lovely and fresh colour! I recently stumbled across your blog and I LOVE it! I love the layout to the content and everything in between! Your nails are just impeccable and your blog is simply the epitome of perfection! I am your newest, most avid follower, I look forward to reading your future posts. I would love it if you could perhaps follow me back too? Have a lovely day! what a great summer nail polish! I don,t remember to have a problem, please try again!! Awwww thank you so much for your kind words!! Love your blog also!! Thanks Daisy, I love it also! !